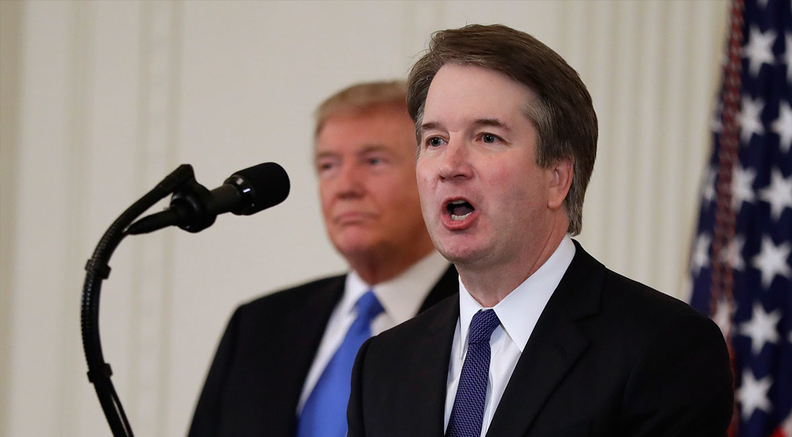 President Donald Trump late Monday nominated Judge Brett Kavanaugh to fill the Supreme Court seat Justice Anthony Kennedy vacated just 12 days ago. Kavanaugh, who currently sits on the U.S. Court of Appeals for the District of Columbia Circuit, has a wide ranging record on healthcare issues including Obamacare and abortion issues, which advocacy groups are focusing on as a key point in his Senate confirmation battle. Trump promised to nominate a justice who would vote to overturn Roe v. Wade, but Kavanaugh told senators in 2006 that he would uphold the precedent. He has since sided with some abortion restrictions. Legal experts view an upending of the landmark 1973 ruling as unlikely, especially in the short term. Abortion rights and reproductive rights groups instantly lambasted the nomination. They are preparing a fierce fight against his nomination, and anti-abortion advocates are pouring money into political action committees to support him. On the Affordable Care Act, Kavanaugh authored a ruling on the individual mandate from the D.C. Circuit that observers claim set the stage for the Supreme Court to uphold the law through the mandate, which Chief Justice John Roberts defined as a tax. Kavanaugh also sided with the Obama administration in Sissel v. HHS on upholding the ACA as a House-authored bill even though the case argued that the law did not appropriately originate in the House because the Senate had substituted its own language. Democrats will likely home in Kavanaugh's abortion and contraception record, particularly as Republicans will need the votes of Sens. Lisa Murkowski (R-Alaska) and Susan Collins (R-Maine), the only abortion rights advocates among the Senate GOP. Abortion rights advocates are also homing in on Murkowski and Collins. In late 2017, Kavanaugh voted against the Garza v. Hargan case in which his fellow judges backed an undocumented immigrant teen who sought an abortion while in HHS custody. In 2015, he wrote that Obamacare's coverage mandate for birth control undermined religions rights. Collins, who told reporters early Monday evening that she did not accept the president's invitation to attend the White House announcement, praised Kavanaugh's "impressive credentials and extensive experience," but walked a careful line in her statement. "I will conduct a careful, thorough vetting of the president's nominee to the Supreme Court, as I have done with the five previous Supreme Court justices whom I have considered," Collins said. "I look forward to Judge Kavanaugh's public hearing before the Senate Judiciary Committee and to questioning him in a meeting in my office." In the White House East Room announcement, Kavanaugh and Trump touched on points that appeared to acknowledge the fraught environment in which the nomination has been put forward. Trump said that he did not ask Kavanaugh for his personal views on political matters in the interviews that led up to the nomination. Kavanaugh noted that he was proud that most of the clerks he has hired have been women. Senate Majority Leader Mitch McConnell (R-Ky.) plans to usher the nominee through the Senate well in advance of the November midterm elections. A spokesperson for McConnell said Kavanaugh will begin meeting with senators this week and that the Senate Judiciary Committee will announce the hearing date after consulting with the White House. The two most recent confirmations—of Justices Sonia Sotomayor and Neil Gorsuch—took about 66 days each from nomination to final approval.